"Megamind" takes a heaping scoop of “Despicable Me,” a dash of "The Incredibles” and a soupcon of "Superman" to explore questions about destiny and the timeless battle between Good vs. Evil. But it’s a lot fresher and funnier than that. After an amusing, if overlong, intro, the film then takes us to Metro City, where the super-villain Megamind (Will Ferrell) finally manages to destroy his arch nemesis, Metro Man (Brad Pitt). But Megamind’s rush of elation is quickly replaced by gut-wrenching ennui, as he realizes that the life of a supervillain is rather empty in the absence of a superhero. So Megamind sets out to create a new hero, Titan -- or Tighten (Jonah Hill), there’s some disagreement over this -- despite his trusty sidekick Minion (the perfectly cast David Cross) warning “it's a bad, bad” idea. Sure, enough, the whole Titan thing goes awry and soon, Megamind is forced to reconsider his priorities, his values, his motivations -- his very essence. 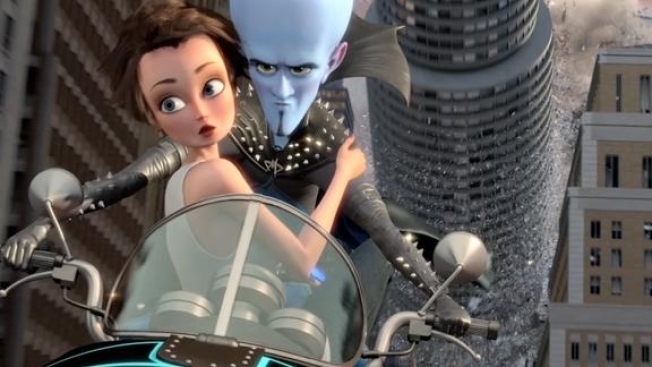 Complicating Megamind’s existential crisis, of course, is a girl, the beautiful TV news reporter Roxanne Richi (Tina Fey), the Lois to Metro Man’s Clark. The parallels between “Megamind” and “Despicable Me” are too numerous to ignore, from the villain-as-hero conceit to the questions about destiny to the films’ incestuous talent pools. “Megamind,” however, leverages its talent to cover similar ground to much greater effect. "Saturday Night Live" alums Tina Fey and Will Ferrell chat at the "Megamind" junket about the impression they had of each other when they first met on the set of "SNL." Plus, why did Tina sign a copy of Sarah Palin's book, "Going Rogue"? Art director Timothy J. Lamb and his team have created a beautiful shining city and a magnificent villain’s lair, littered with nefarious contraptions, robot-toadies, dusty trophies and all manner of evildoer must-haves. And the depth of expression they manage to bring to the faces -- and particularly the eyes -- of the characters is remarkable, making even the schmaltzier moments at least feel real. Director Tom McGrath is to be commended for showing restraint in making use of the 3D technology at his disposal. Rather than the gratuitous poke-you-in-the-eye approach of “Despicable Me,” McGrath lets the story call for the third dimension, not the other way around. Both Ferrell and Fey are great, as the preening doofus and the earnest do-gooder, two pieces of typecasting that are saved by the film being animated. Meanwhile, Pitt and Hill, are relegated to carrying water, not really bringing much to the table. Neither is bad, just a bit uninspired. If you’ve got an adolescent haranguing you to go to the movies, “Megamind” will keep you both entertained. If you’re an overgrown adolescent, you’ll like it even more.